GT racing legend and former co-cheif executive of the ChampCar World Series, Paul Gentilozzi is taking a break from a gruelling development program to feature the XKR in the largest dedicated trade motorsport exhibition in Europe. The race car will be on display at the Jaguar booth alongside a production model XKR, XFR, and the fastest Jaguar ever – the Bonneville XFR prototype, which Paul drove to 225.675 mph on the Bonneville Salt Flats in 2008. 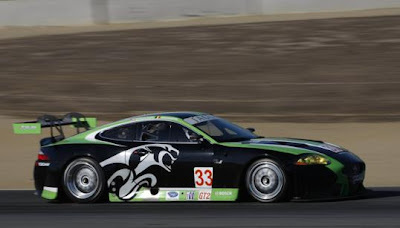 Jaguar asked the Michigan-based RSR team to help create a race car to compete in GT2 racing in 2010. The Jaguar engineering and design teams, based in Coventry, have jointly developed the car from a standard road-going XKR with the RSR team. The new Jaguar RSR racing car makes its European debut this week at the 2010 Autosport International at the NEC in Birmingham, UK. It is the first and only chance for the public to see the stunning new XKR GT in the metal before it heads back to the US to compete in the entire 2010 American Le Mans Series (ALMS) in North America. The competition car uses the standard Jaguar XKR lightweight aluminum monocoque together with additional steel reinforcements and safety structure developed by RSR. The 5.0-litre V-8 engine boasts 550 horsepower at 7000 rpm and a maximum speed of 180mph. The Jaguar RSR XKR GT made its racing debut during the Petit Le Mans event at Road Atlanta in Braselton, Georgia, in September 2009. The car took its first green flag in the American Le Mans Series season finale at Mazda Raceway Laguna Seca in October and is set for a full-season championship effort in 2010. Mike O'Driscoll, managing director of Jaguar Cars said: "Our designers and engineers have taken the best of our standard road-going XKR and with Paul Gentilozzi's motorsport expertise created a first-class competition car. Paul and his RSR team are confident that they can compete against some serious competition in the American Le Mans Series (ALMS). 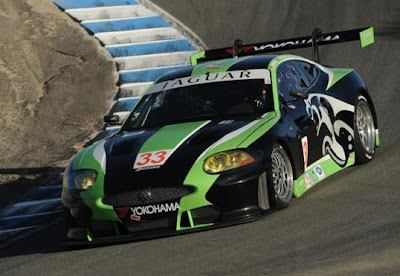 Aside from his role as team owner, Paul is one of the drivers for the #33 JaguarRSR XKR. Next up? The ALMS Winter Test February 22 – 23 at Sebring International Raceway in Sebring, Florida and Season Opener – the 12 Hours of Sebring, March 20. This morning, those who had been following the exploits of the Toyota Formula racing effort throughout the last couple of seasons, woke up to an email communique outlining the last efforts Toyota Motorsport GmbH will be doing to close the final chapter of their effort. Jarno Trulli and former Champ Car World Series driver, Timo Glock have moved on, both have signed to drive with newly formed teams for the 2010 F1 season. Jarno was confirmed as one of the newly-formed Lotus F1 Racing's team drivers, joining former McLaren driver Heikki Kovalainen. Timo chose an option where he will be guaranteed a drive, although the car might be less competitive, at the newly formed Virgin Racing. Virgin's car for 2010 will be the first F1 car designed entirely using CFD computer simulation technology and will be powered with Cosworth engines. Timo will be teamed with long-time Brazilian GP2 regular Lucas di Grassi. A visit to the farewell website is a wonderful mix of photography, technology, and past F1 memories. Toyota Motorsport GmbH bids farewell to Formula 1 with an offering to all those who supported it during eight emotional seasons at the pinnacle of motorsport. Fans, media and sponsors alike can relive memories from the team in the form of exclusive photos and videos, including an eight-minute video retrospective featuring exclusive footage of moments which variously made us laugh, smile or shed a tear. Simply visit http://ms.toyota.co.jp/en/ and click on the banner ‘A Virtual Goodbye to Formula 1' to look back on our time Formula 1. Since our first season competing in Formula 1, in 2002, we have experienced a whole spectrum of emotions but through the highs and the lows, we have been fortunate to enjoy the valued support of partners, media and fans. There have been so many sponsorship campaigns, media collaborations and distributor initiatives it is impossible mention individual cases but we would like to sincerely thank all those partners, media and fans who have been part of our Formula 1 adventure. This special website represents the final act for the marketing and communications department, which has ceased normal operations. Until further notice, all media enquiries regarding Toyota's motorsport programmes should be directed to Toyota Motor Corporation in Japan on bl-pr@mail.toyota.co.jp while only specific requests relating to Toyota Motorsport GmbH in Cologne should be directed to pr@toyota-motorsport.com. Our media website www.toyota-f1-world.com will continue to function until the end of the year to provide an archive of photography and information from the team's time in Formula 1. Funny, it would be nice to have the same type of departure website attention given to other automobile-culture departures that have happened over this last full year ... and not necessarily departures in motorsport. 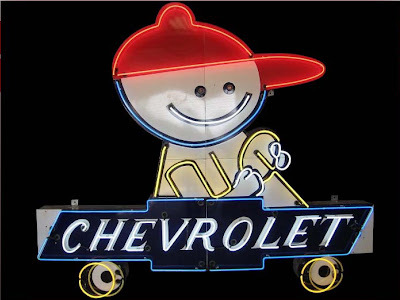 Let's see websites devoted to the history and legacy of Pontiac, Saturn, Dodge Aspen, Hummer ... heck, lets just add General Motors and Chrysler, in general, since they were once proud companies involved in the pursuit of free-enterprise and have departed from the annuals of needs-satisfaction, profit-oriented American automobile manufacturers. After a successful and enjoyable breakfast gathering for inside auto-enthusiasts and members of the press, the day began well for the folks over at the Russo and Steele. Russo and Steele in Scottsdale is a standout against the well publicized "No-Reserve" policy of the other major auction held this week at Barrett-Jackson, in that they hold an auction where all cars are held with a Reserve. This auction operation believes that quality consignments are the result of only two scenarios; either the owner had paid a premium or has endured a costly and laborious restoration. Neither of these two will entice this caliber of automobiles to simply be “sold to the highest bidder – regardless of price” ... hence, "No-Reserve". These consignors want “top dollar” for their car. The challenge all auction companies face is how to attract quality consignments and consign them with appropriate reserves that will be well received by our knowledgeable bidders. A car does not get sold unless it meets the negotiated minimum price - The Reserve. Russo and Steele’s Scottsdale sale occupies the middle ground of the collector car market — roughly $100,000 to $500,000 — offering mainly American muscle cars and European sports cars. But the Russo and Steele auction, which began on Thursday, was interrupted that evening by one of the most severe storms the area has experienced in years. Winds tore at two of the tents the company was using to house cars going to auction, collapsing one of them and sending parts of the other blowing onto the nearby 101 Freeway. Severe weather punishing the American West struck Scottsdale, Arizona with full fury this afternoon during Russo & Steele's auction of ultra rare, blue chip classic cars. See details of Russo & Steele's offerings this year by clicking here. The tents that collapsed were side structures. Thankfully, no one was injured as most attendees were busy watching the action in the main tent. Between 5,000 and 10,000 people were in attendance at Russo & Steele when disaster struck at 6 P.M., according to AZFamily.com. Russo & Steele Auction was immediately evacuated. Even car owners had to leave without knowing the fates of their valuable classic rides. 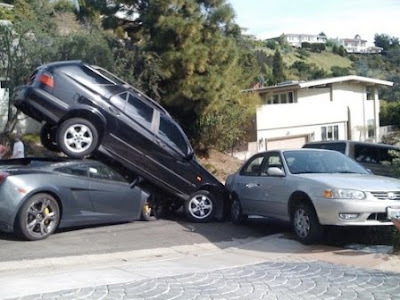 It is believed that several cars were damaged. Arizona state governor Jan Brewer declared a state of emergency due to the extensive impact the severe storm has had all over the state. McKeel Hagerty, president of Hagerty Insurance, which specializes in coverage for vintage cars, said he had surveyed the auction site from a distance. He said he estimated that perhaps as many as half of the 600 cars had suffered at least some damage. “You can see that some of them have been extensively damaged,” he added. Was this the worst disaster the classic car industry has suffered? “Hurricane Katrina was worse,” Mr. Hagerty said. “We lost 500 to 600 classic cars in that one. But, other than that, this is the worst I can remember. Tony George resigned today from the Indianapolis Motor Speedway Board of Directors. Last year, Robin Miller writing for SPEED TV cited a source close to the IMS that confirmed that the 49-year-old grandson of Tony Hulman would no longer be CEO of the Speedway after a vote of the IMS board of directors which includes mother Mari, sisters Josie, Nancy and Kathy, attorney Jack Snyder and George. So now the ouster has been made complete ... Tony George is neither the CEO, or a mamber of the Indianapolis Motor Speedway Board of Directors or any remaining role in Hulman & Company, Indianapolis Motor Speedway, Indy Racing League, IMS Productions and other affiliated companies. The Board of Directors of Hulman & Company and affiliated companies, including the Indianapolis Motor Speedway, has received the resignation of Anton H. “Tony” George from the board of directors effective immediately, according to Mari Hulman George, chairman. “As members of his family, we are sorry to see Tony leave,” said Mrs. George. “We are grateful for his service to our company as a board member and of course for formerly serving as CEO and president of our companies. I speak for our whole family in wishing him well. 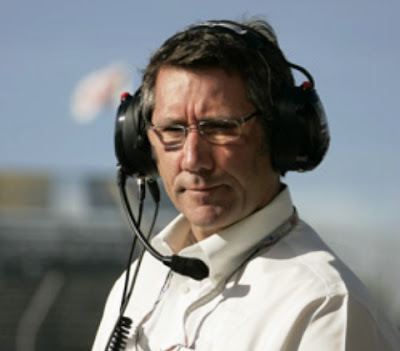 His resignation removes George from any remaining role in Hulman & Company, Indianapolis Motor Speedway, Indy Racing League, IMS Productions and other affiliated companies. His term as CEO of the family companies ended June 30, 2009. He continues to be involved in racing through his ownership of Vision Racing, a competitor in the IZOD IndyCar Series of the Indy Racing League. The board vacancy will be addressed at a later date. In addition to Mari Hulman George, board members include Nancy George, Josie George, Kathi George-Conforti and Jack Snyder. Mari Hulman George said she is very pleased with the direction of the company and the progress that has been made during the last six months. Personally, we at The EDJE wish Tony great success as a car owner in the IZOD Indy Racing League. 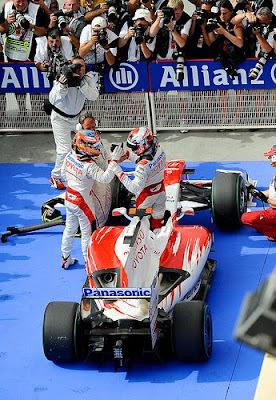 Great success in your sophomore year at the Toyota Grand Prix of Long Beach in April 16-18, 2010. Craig Jackson, CEO of Barrett-Jackson Auction Company, gave a visit to members of the Motor Press Guild (MPG) at their monthly meeting luncheon, Tuesday, Jan. 12, and passed on insights about the process of large scale Automobile and motor culture memorabilia auction sales. Barrett-Jackson's kicks off their year of auction event activity with the annual session that got the ball rolling in 1967, a car show they called, with the appropriate flair, "Fiesta del los Auto Elegance." held in Scottsdale, Arizona. The event was a fundraiser for local charities, including the Scottsdale Library and the community art center. Today, Barrett-Jackson Auction Company holds annual auction events in Scottsdale, Arizona - January 18-24, 2010, Palm Beach, Florida - April 1-3, 2010, new this year ... Orange County, California - June 25-27, 2010, and ending the year in Las Vegas, Nevada - September 23-25, 2010. Craig presented a positive view of the collector car industry as he opened with a short video, spoke for a short time on the state of his industry, and opened the floor to questions. One of the most interesting questions posed went like this ... You have probably seen it all so is there an auction item that sticks out in your mind that you would like to share? Craig responded that just recently, at the last Las Vegas auction, he and the staff were left looking at each other, dumbfounded, when the hammer came down on a car for $112,000 dollars. 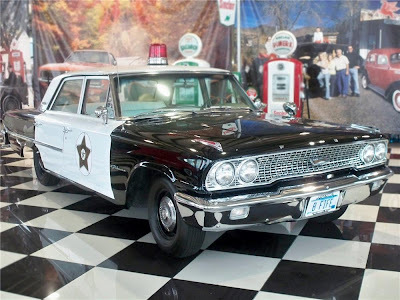 The car was a black & white 1963 Ford Galaxie squad car replication of the television version of the squad car used in the long running TV series, The Andy Griffith Show. 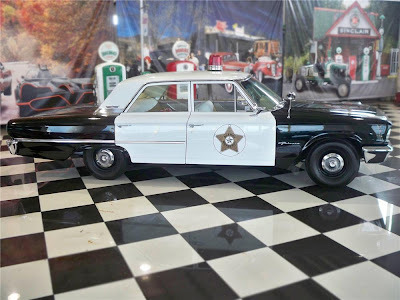 Yes, the Mayberry RFD Squad Car ... but this one was a replica built for a Barney Fife (Andy's nervous cousin as played by Don Knotts) impersonator. The car had sold for just about half that price at a previous Barrett-Jackson Auction event (Scottsdale). Then Craig Jackson made the statement of the afternoon's presentation - "That is why there are auctions ... it only takes two who have an interest in an item, then anything can happen." All auction events held by Barrett-Jackson are classified as "No Reserve", in other words, all bids have the potential of purchasing the car from the seller, and the seller is not allowed to place bids hoping to drive the bidding process up (Barrett-Jackson have people checking the background of bidders as strongly as they know the background of the items up for bid). Further, Barrett-Jackson has contracted with Deloitte and Touche to fashion a code of ethics and procedure to govern the auction process so that people who are involved through either being the seller, or being the bidder, know they are operating on a legitimate and level playing field. For Barrett-Jackson's part, they will pull an item if for any reason a question about its provenance (background history and authenticity) comes up at anytime before the actual auction. Due diligence is of extreme importance to this process, in that, in Scottsdale, for example, the majority of items being auctioned are going to be sold from between $50,000 to over $100,000 and confidence in the process is what Barrett-Jackson is really selling at each and every event. See you all at the next Barrett-Jackson - The World's Greatest Collection Auctions - event in Scottsdale, Arizona - Westworld of Scottsdale - 16601 N Pima Rd, Scottsdale, AZ 85260 - January 18-24, 2010, and televised LIVE on SPEED Channel since 1997 (consult your local cable listing for broadcast dates). 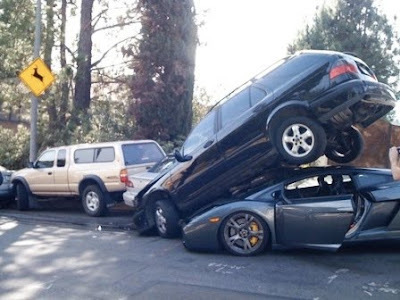 Today, January 10, 2010, was a day one Lamborghini Gallardo owner/driver (assumed) went a little off on one of the very tight and winding streets just off of Laurel Canyon in the Hollywood Hills North and West of Los Angeles ... a couple of miles North of the Sunset Strip. The exact street location was not stated in the report posted at Jalopnic, but judging from the photos, the street was similar to Willow Glen (or Mount Olympus) ... way too tight and winding. Not a street to be cruzin' at about 560hp strength and speed. The driver managed to upend a SAAB 9.5 (judging roofline and back door separator bodywork), throwing it into a Toyota Corolla which then was pushed into a Toyota extended cab pick-up truck with shell. Most people only dream of being able to ride in ... let alone drive a Lamborghini. At the recent Motor Press Guild's Press Day (actually held over a two day period) two Lamborghini cars were delivered for the gathered members of the Press to drive (the Gallardo) and ride (a Murcielago driven by IRL race car driver, Richard Antinucci). The driving was restricted to about seven to ten miles of street type of driving around Auto Club Speedway in Fontana, whereas the ride in the Gray 680hp Murcielago was three laps at IRL speed on the 1.5 mile infield road track - WOW! The Lamborghini contingent was only available for the first of the two days, so if one was not early on the list to drive or ride ... one was out of luck. The last three laps of the day with Richard Antinucci, according to Richard ... were the most exhilarating laps he took all day. He was able to reach about 160mph at the end of the short front straight-away each time through, before breaking for the tight right then left-hand turns to begin each lap on the tight infield course. The Lamborghini tale of woe will end up costing a bit of money and time, but maybe next time the Gallardo pictured in the accident photos will be able to be driven by its owner at full speed on a closed course like Willow Springs International Motorsports Park or up north at the 3.0 mile, 15 turn workout of a road course at Thunderhill Raceway Park. X Game standout and action sports regular Travis Pastrana set a new world record to open up the new year, 2010, on ESPN. The daredevil shattered the world record for the longest jump in a rally car last Thursday night, making a nearly perfect flight of 269 feet from the Pine Street Pier onto a barge anchored in the harbor. After teasing the crowd, estimated to near 20,000 thousand, with a warmup run down the 1,000-foot run-in and up the takeoff ramp, Pastrana took off in serious fashion, flying across approximately 200 feet of water to the landing ramp on the barge just a few minutes after midnight EST to bring in the new year. 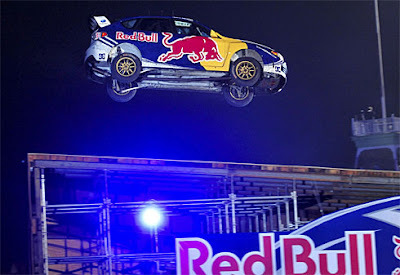 His Subaru skidded sideways after landing and slammed into a wall at the end of the barge, but Pastrana emerged unscathed, ran to the end of the barge and after getting his response from the crowd, did a backflip into the Long Beach harbor water. The old record was 171 feet set by Pastrana's Subaru teammate, Ken Block, in a rally car in November 2006. Pastrana wanted to break that mark by more than 100 feet. "The flight was awesome," the 26-year-old daredevil said. "I couldn't have asked for anything better." Asked to comment on his celebration jump from the Red Bull landing ramp into the harbor waters ... "It's soft," jester-ed Pastrana. "It was a lot colder than I anticipated." He broke the old record by 98 feet. "This is one of the cooler feelings, just to be part of something so huge," Pastrana continued. "It was kind of pass or fail. It was just a really good time and trying to push the envelope of what's possible in a car." The stunt was the latest in Red Bull's New Year, No Limits series. Happy 2010 to Travis Pastrana, Red Bull, Subaru, the City of Long Beach, and all who just love the setting of world record marks in this Motor Culture world. Automobile racing tends to grab a young heart, early in life, and the feeling never lets go. Maybe, it's just the vibration and note of a well-tuned exhaust or the aerodynamic art of the racing platform design or just the automobile/sporting culture and nature of competition ... but once bitten, twice smitten; these are ... notes from The EDJE (pronounced edge)!